First things first. 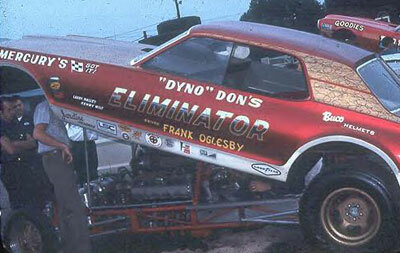 I heard from Frank Oglesby, who took mild exception to John Jodauga’s seemingly innocuous comment about Oglesby's time behind the wheel of Nicholson’s Eliminator Cougar not resulting in “the same level of success” that “Dyno” enjoyed. Oglesby was the crew chief for Nicholson when he won the S/XS class in Indy in 1967 -- their reward for a class win? A Craftsman tackle box, fender covers, and a $100 government bond – and took runner-up honors behind Paul Stage for the overall Super Eliminator victory. 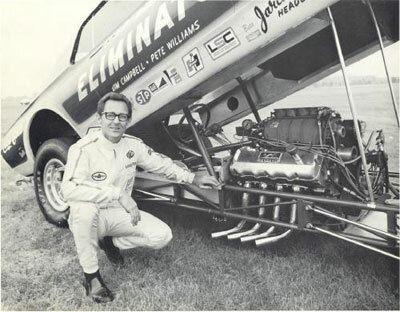 According to Oglesby, he ended up working for Nicholson after he and Jay Howell had built a supercharged machine for Bill Taylor that beat Nicholson’s injected Comet “like a redheaded stepchild” three or four times in a row. Deciding that he’d rather switch than fight, Nicholson hired Oglesby, who already had experience driving nitro cars and took the job with the proviso that he would get to drive in the future. So, once again, your prototypical DRAGSTER Insider story behind the story -- isn’t there always one? -- and I really love Nicholson's "and not kill me" disclaimer. For the uninitiated, acid-dipping was a popular practice in the late 1960s and early 1970s before the influx of fiberglass and carbon-fiber parts. It’s a simple as it sounds: Lower your metal body parts into large vats of acid and let it eat away at the metal until they are substantially lightened. The trick, of course, is to not overdo it. I found an article in the May 1972 issue of Car Craft about Nicholson’s Pinto that followed his two-year stint in Mavericks. The article reported that Nicholson sent his Pinto body-in-white and three doors (sides plus hatchback) to Aerochem in Orange, Calif., where the acid bath removed about 80 pounds of weight. The lightened-but-flimsy metal then was strengthened from the inside by the addition of lightweight polyurethane panels. 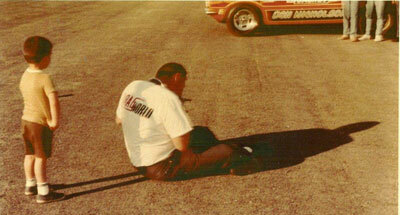 I asked around to several early Pro Stock experts I know but came up empty. My best bet was class historian Rick Voegelin, who replied, “Sorry, can't confirm that. Back in the day, urban legend was that one of the Mopars had spent too much time in the tank and came out missing significant parts. Acid Dipping Urban Legend No. 2 is that Roger Penske's '69 Sunoco Camaro was left in too long, roof became a trifle thin, and hence the black vinyl top on Mark Donohue's championship-winning Trans-Am Camaro." So, back to the original question … anyone out there know if the Maverick tale is true? On Tuesday, I shared my story about a neighborhood encounter with the Psycho Mustang fuel altered/Funny Car hybrid, hoping to find out how it ended up living next door to me in Culver City, Calif. That part of the mystery remains intact, but I was able to get a lot of other info about the car. Bill Duke, a sergeant with our own LAPD, had lots of firsthand info about the car because original pilot Pat Mahnken lived in his neighborhood. “Mahnken lived a block away from me at the time,” he recalled. “Initially, the car was a tangerine-hued, Topolino-shelled creation. Initially, a blown gas 427 Ford wedge was used, and the car earned the title of either UDRA or AHRA gas altered point champion for 1965. I can’t recall the sanctioning body, but I know the award was bestowed upon them at Lions. Though gas-powered, the team qualified for the newly formed four- and eight-car AA/FA shows that were beginning to surface. The Fiat even won a AA/FA event, edging out ‘Wild Willie’ [Borsch]. I recall Mahnken's jubilation that Sunday. The car's last venture as a classic altered was very early 1966; shortly before, during, and maybe after a week or two of the AHRA Winternationals that were held that year at Irwindale. 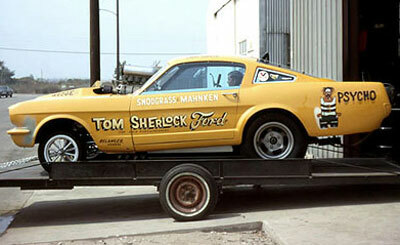 I recall seeing the car parked in front of the Mahnken residence with its new Kellison Mustang shell sans lettering. 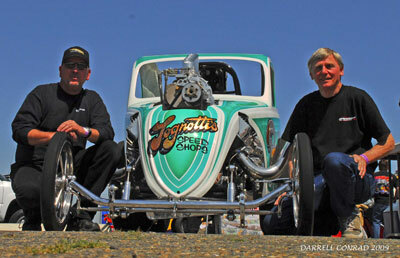 “From there on, it was a regular staple of the weekly eight- and 16-car shows that proliferated the SoCal area. The car was even chosen to serve as part of the Ford Team at the ‘68 U.S. Manufacturers Championships. 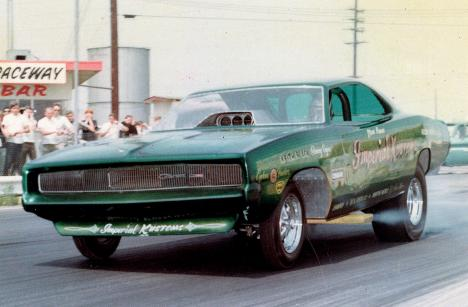 However, the car's biggest win was that which was earned by it clinching the 1967 Hot Rod Magazine meet in Super Eliminator. For years, I had the HR article that was done on the car because of its very performance that afternoon. “While I can’t offer a historical accounting of the car's adoption of SOHC heads, I can safely make claim that it was the original altered hybrid that left these shores and went way south to Australia sans the SOHC motor. I have seen a few pics on the HAMB of the altered version, then replete with 392, being displayed at an Aussie car show. The maiden voyage found the chute to fail, resulting in it crashing in the shutoff area. “The Gas Ronda version was dubbed Psycho II. However, it ceased running as a AA/FC by the end of 1969. Too long in the tooth. 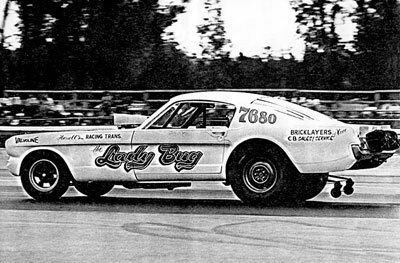 Mahnken then ran a SS/Stock Mustang for a while in 1970. I can’t recall if it was his old employer, Tim Sherlock (or Fougler, maybe Galpin) that served as a sponsor. 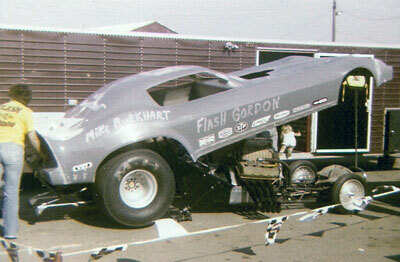 Anyway, in 1971, the ex-Ronda Funny Car returned with 427 Ford wedge and twin carbs. Now here is where things have a human-interest story. 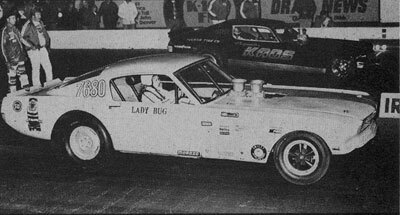 “Mahnken found the ideal combo that allowed that Mustang to run easy mid-10s with atomic-clock consistency. I think he was winning three weeks out of four. This was when the Bracket I payout was maybe 80 or 90 bucks, a fortunate state of affairs for Mahnken as he had been the victim of a then major recession, and his position with the former car dealership had been eliminated, and he was literally able to support his family off the winnings earned week in and week out at Irwindale. “The car remained in that guise for years. The last I saw it was maybe 1976 or so when his (don't quote me here) ex-wife got it and was racing the short-lived Econo Funny Car circuit. 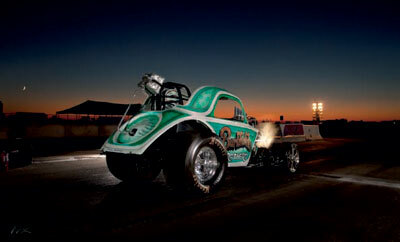 Nothing had changed except that the car was no longer dubbed Psycho but had been coined as the Lady Bug." Dennis Doubleday confirmed the final part of Duke’s narrative, supplying photographic proof of the car’s life after Psycho, listing Betty Ryan as the driver. I remember seeing this car run many times at Irwindale and OCIR and never could have dreamed that this may have been the same car that lived across the alley from me as a teenager. Kim Fuller recognized the photo of the Psycho Mustang on the trailer as having been taken on Motor Avenue, just west of the Irwindale racetrack. “As a kid, I used to ride my Schwinn down there almost daily," he reminisced. "I can’t remember exactly who it was, but they used to let me in the shop to look around. It was one of my almost-daily stops, along with riding to the turnoff roads at Irwindale and stopping by M&S Welding to see what Sherm [Gunn] was doing." I’ve asked Fuller (and he’s agreed) to expand his little tale here to talk in detail about his introduction to the sport via proximity to cool cars as part of a collection I asked for earlier this week. I’ve already received about a half-dozen great stories of how so many young kids were introduced to the sport by nosily sticking their noses in garage doors where cool things were happening, and I want yours, too! Lastly, here’s more feedback from the Fan Fotos collection I showed off, which included a photo of the Burkholder Bros. altered and led to Henry Walther’s humorous story about hitting a rabbit (well, humorous except to the bunny, I guess. And PETA. And the ASPCA.) at the top end while racing Harry Burkholder. Walther shared a link to the story with Burkholder (upon whom Walther had hung the nickname “Hairy” while authoring the Nor-Cal Scene column for Drag News back in the day), and I was pleased to hear from “Hairy” himself. Got wild animals at the drags stories? Share! And finally, from prolific Insider contributor "Chicago Jon” Hoffman comes this reference to another image from the Fan Fotos segment. The battle-scarred floppers of Don Schumacher, far lane, and Ed McCulloch got it on in the "ugly" final at the 1972 Summernationals; Schumacher won. “We all remember the commercial; the one guy’s walkin’ down the street, eating a chocolate bar (makes sense), another guy is walking down the street grazing on a jar of Skippy (which, when you think about it, is kinda creepy); they collide, two good ideas become one GREAT idea. Which brings us back to the Insider. I always loved how back in the day, the racers would have to slap their cars back together and get back out there for those lucrative dates, be they national events or a Wednesday-night match race, and -- no offense to the great paint jobs of the day -- I would always migrate over to someone whose car was in primer or whatever. 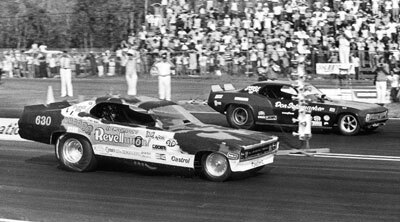 In 1972, in what was billed as the 'ugliest final EVER,' Don ‘the Shoe’ [Schumacher] and Ed ‘the Ace’ [McCulloch] squared off in Englishtown, and a few weeks later repeated the feat at Ron Leek’s Byron Dragway, so, how about a – drum roll, please -- Fan-Fotos-of-primered-cars theme? OK, so there’s the grist for another future column. I’ll keep my eyes peeled for more primered hot rods and expect a torrent from readers. Could be interesting, if not pretty. In fact, this could get downright ugly, which is pretty much how we roll here at the Insider anyway. Keep on writing.